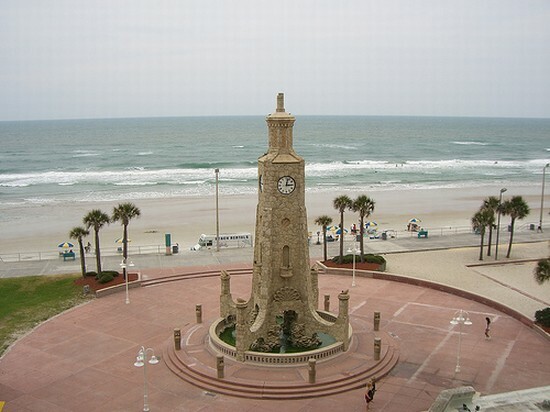 Daytona Beach's Coquina Clock Tower was constructed alongside the Daytona Bandshell. Construction on both started in 1936 and they were dedicated in 1938. Both were built as part of a Work Progress Administration (WPA) project and are listed on the National Register of Historic Places. Prior to European contact, the Timucuan Indians inhabited the land in and around the Daytona Beach area. Spain claimed Florida in the early 1500s. Permanent settlers began to enter the area in the mid-1800s. In 1870, Mathias Day, Jr., an inventor and newspaper publisher from Mansfield, Ohio, purchased property on the Halifax River and built a hotel around which a small community arose. Though he lost his land in 1872 due to financial troubles, residents named the adjacent city Daytona, which was incorporated in 1876. The area began to experience considerable growth with the arrival of the railroad in 1890. 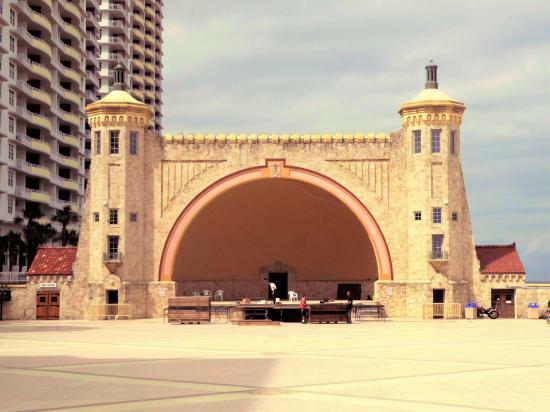 In 1926, Daytona and two settlements on the other side of the Halifax River, Seabreeze and Daytona Beach, joined to form the city of Daytona Beach. The hard-packed sand of local beaches provided the perfect setting for testing just how fast newly invented automobiles could go. Beach racing continued in Daytona Beach until the world-class Daytona International Speedway held the first Daytona 500 in 1959. The Halifax Historical Museum houses a permanent exhibit marking the 100th anniversary of auto racing. In 1941, Jackie Robinson played in the first integrated spring training baseball game here with a Brooklyn Dodgers farm team, later becoming the first African-American to play in the Major Leagues. Today, historic Jackie Robinson Ballpark is being renovated to its 1941 appearance and a museum is being developed. Another important civil rights figure in Daytona Beach was Dr. Mary McLeod Bethune, founder of Bethune-Cookman College and a government official for Presidents Coolidge, Roosevelt, and Truman. Her former home is now a museum on the campus. The historic Dr. Josie Rogers House will being renovated for use as a visitor information and an environmental education center. Downtown Daytona Beach's historic district is listed in the National Register of Historic Places and is a Florida Main Street. House tours promote preservation and encourage home ownership in the district.